Properties in Community of Madrid average 4.4 out of 5 stars. Design loft with views, open space causing different emotions. Property 6: Design loft with views, open space causing different emotions. Apartment near Plaza Mayor, free wifi, air condition. Property 11: Apartment near Plaza Mayor, free wifi, air condition. Chueca along Gran Vía. Bright and with views. Property 21: Chueca along Gran Vía. Bright and with views. Property 29: FERNANFLOR COMFORT. Luxury apartment. ILAIA MADRID PALACIO. Special price in August. Property 34: ILAIA MADRID PALACIO. Special price in August. MADRID-SOL-GATE PLAZA MAYOR, New Apartment, Comodo, modern design. 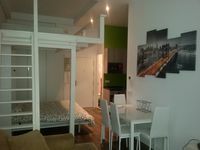 Property 38: MADRID-SOL-GATE PLAZA MAYOR, New Apartment, Comodo, modern design. This property was very suitable for our needs. To our pleasant surprise, there were fruit and pastry and some drinks on the table. The property was located in a nice part of the city. There were supermarkets close by and several quality restaurants and cafes. It was also close to the bus and metro locations. We enjoyed our stay at this property. Jorge's place was perfect in every way! From the time I booked, until I got to the apartment, Jorge was guiding me every step of the way. Lourdes (his sister) met us when we arrived &amp; explained everything there was to know about the place. The apartment itself was clean &amp; roomy, more than enough space for 3-4 people. Location was also perfect, just off of Calle Atocha, and not more than 5 minutes walk to Puerta del Sol, Tirso Molina Metro &amp; Supermarket Dia...I was so glad I stayed here &amp; I'd do it again without hesitation! Muchisimas gracias Jorge!! !